The new Cat® 16M3 motor grader features engineering enhancements that boost fuel economy, increase structural durability, simplify maintenance, add operator convenience and promote the safety of both the operator and those around the machine. The 16M3 is available in configurations to meet engine emissions standards worldwide. the lowest cost per tonne of material moved. The 16M3 has a 16ft (4.9m) mouldboard and an average operating weight of 71,454 pounds (32,411kg). 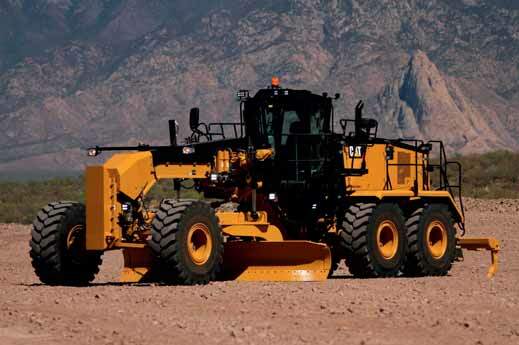 The motor grader is optimally sized for operations using 150-tonne (136-tonne) or smaller trucks. The 16M3 features a Cat C13 ACERTTM engine with the Cat Optimized Variable-Horsepower system, which provides net power ratings from 290–348 horsepower (216–259kW). The engine is available in three configurations to satisfy global emissions standards: US EPA Tier 4 Final/EU Stage IV/Japan 2014 (Tier 4 Final);Tier 3/Stage IIIA /Japan 2006 (Tier 3) equivalent; and Tier2/StageII/Japan2001(Tier2)equivalent. A new ECO mode, standard for Tier 2 equivalent and Tier 4 engines, is designed to improve fuel economy by optimizing engine speed to 1,900rpm in working gears when possible with no compromise in performance. This operator-selected feature delivers fuel savings estimated at up to 4% to 5%, compared with working in comparable light- to moderate-load applications with the system deactivated. An additional engine control system feature provides consistent power to the ground by continually adjusting the engine to compensate for power losses to the cooling fan. Also new for the 16M3 is the ‘OK-to-Start’ system, which automatically checks the engine coolant, engine oil, and hydraulic oil levels when the key is turned to the on position. The system also monitors these levels and the trans-axle oil level during operation, and it alerts the operator if levels drop too low. The Cat direct-drive, power-shift transmission, with eight forward and six reverse gears, incorporates the Cat Advanced Productivity Electronic Control Strategy (APECS) system, designed to smooth gear changes and promote productivity. The modular trans-axle now has a standard automatic differential lock, which ensures appropriate locking/unlocking for optimum traction and manoeuvring, thus averting possible damage from ill-timed manual control. The 16M3 also features nearly 15% greater dynamic braking torque at the rear tandems, achieved by enlarging both the brake disc diameter and the piston area. A new manual brake wear indicator simplifies disc wear measurement, eliminating having to remove the brake pods to check wear. The 16M3 front frame, hitch area, and rear frame have been specifically designed to ensure long-term durability with the added weight and power of the new model. The centre-shift section is now a heavy-duty steel casting designed to effectively distribute stress and enhance durability in this highly loaded area of the mainframe. The rear frame is lengthened, incorporating two bumper castings for added counterweight, and the hitch plates (at the articulation joint) are 50% thicker than those of the 16M. Thelongerframeimprovesmachinebalanceandsteering control and provides easier access for routine maintenance. The new full-colour touch-screen display, with an intuitive menu structure, allows the operator to monitor machine performance, set parameters to suit operating situations, and access service information for initial troubleshooting. The new display also shows Cat Grade Control Cross Slope readings and DEF (diesel exhaust fluid) level. In addition, a new keypad with lighted, one-touch buttons replaces most of the three-position switches used previously, further easing the operator’s job. Advanced Control joysticks (a retrofit option) enhance control of the Cat Grade Control Cross Slope or AccuGradeTM systems and also have provision for auxiliary-hydraulic control. Also standard for the 16M3 is the Caterpillar Vital Information Management System (VIMSTM), which provides real-time information about machine health and surroundings, trends, events, and other vital machine information to support production and planning. The optional enhanced-access platform provides ladders, walkways and handrails that allow access to the cab or engine compartment from either side of the machine. An available service access configuration has ladders, walkways and handrails for convenient access to the engine compartment from either side. Double doors provide open access to the engine and use stainless steel barrel hinges for easy removal. An available fire- suppression-ready package facilitates installation of most recommended fire-suppression systems suitable for the 16M3. Key service intervals have been extended for the 16M3: engine air filter and pre-cleaners have twice the life, compared with the 16M, and service intervals for the main hydraulic, pilot and transmission filters have doubled from 500 hours to 1,000 hours when S•O•SSM sampling and Cat filters are used. In addition, transmission/rear-axle fluid-change intervals are extended from 1,000 hours to 2,000 hours with S•O•S sampling. The 16M3 also uses a new modular cooling package, which facilitates removal and installation of components in the cooling system, providing an estimated time saving of 20%, compared with the 16M. Clean-out doors provide easy access to the cooling cores. A durable metallic fuel tank is modular in design and can be serviced with fast-fill fuel systems delivering up to 150gpm (567.8 litres). The new radiator shunt tank is fabricated of metal. On models equipped with a DEF tank it has been strategically positioned at ground level for easy filling when the fuel tank is being filled.